There must be a million banana bread recipes. Almost everyone has a most-loved version, whether it’s passed down in the family or a preferred interpretation. But we think our southern-style recipe might be your new favorite. 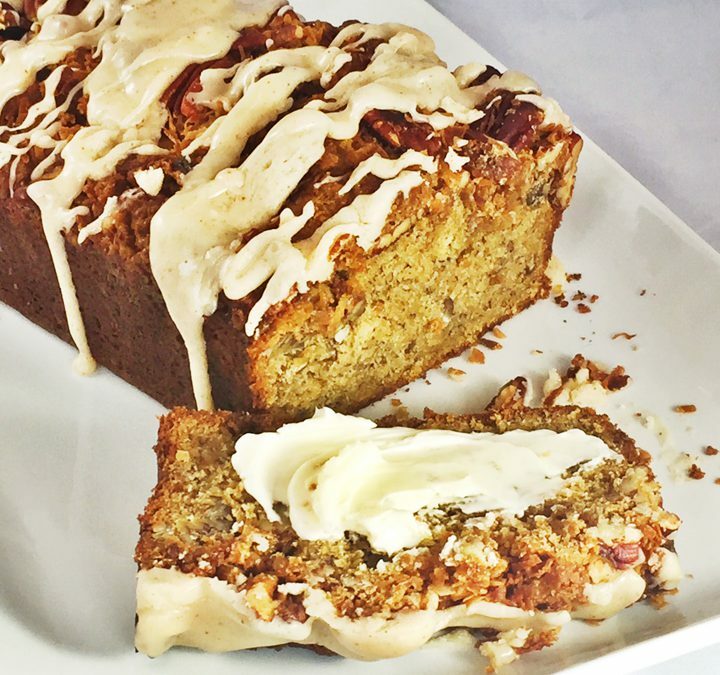 Our quick bread not only features a delicious banana flavor with a soft cake-like interior, but a streusel topping loaded with toasted coconut and pecans. Then to push it over the top, we added a yummy brown butter icing. Preheat oven to 350°F. Butter a 9×5″ loaf pan then line it with a piece of parchment paper that overlaps on the long sides of the pan. Butter the parchment paper then dust with flour. Remove any excess flour by tapping the pan upside down over the sink. In a medium bowl, mash the bananas until smooth then combine with sour cream and vanilla extract. In a separate bowl, whisk together the flour, baking powder, baking soda, and salt. In the work bowl of an electric stand mixer or hand mixer, beat ½ cup butter and brown sugar on medium speed until light and fluffy, about 3 ½ minutes. Add the eggs one at a time and beat on medium speed after each egg until thoroughly combined. Add banana mixture and beat until just combined about 30 seconds. Add dry ingredients in 2 batches, beating on low after each addition and scraping down sides of bowl until fully incorporated. Using a spatula, fold in the pecans. Add the batter to prepared pan and smooth top with a spatula. Stir together melted butter, granulated sugar, firmly packed brown sugar, flour and vanilla extract, when combined add in the toasted coconut and whole toasted pecans. Crumble over the top of the banana bread, pressing in very lightly. Bake, rotating halfway through until batter is set and a tester inserted into the center of bread comes out clean, about 60 minutes. Cool in pan on a wire rack at least 15 minutes, run a knife around the bread to loosen it, then using the parchment paper overlaps gently pull the bread out of the pan. Transfer to a cutting board and gently remove the bottom parchment. Cool completely. Brown Butter GlazeTo make the glaze, add the butter to a saucepan and frequently stir over medium heat until it starts to foam. When the foaming ends, stop stirring, and let it continue to cook until amber brown. Remove from heat, and stir in powdered sugar and then the milk, 1 tablespoon at a time, to make the glaze your desired consistency. Drizzle over cooled banana bread and slice with a serrated knife to serve. Make 12-14 servings.